Due to redirecting funds to the electricity project support for housing has been reduced. Housing has become very expensive not only the building and materials but getting ‘permission’ from the local authority for both the rebuilding of existing houses and the building of new ones. We did however have four housing projects this year. Being in Ethiopia during the rainy season did highlight the need for a secure and watertight house. We supplied tin roofing to repair a temporary roof for a mother who has 3 children supported by the project in both day care and school. Although she owns her house she could not raise the funds for the repair. Now the roof is secure and watertight. A lady called Bzaye Dersfed has her 20-year-old daughter living with her. The current house is beyond repair but she has permission to rebuild the house. Without the support of the project this would not have been possible as Bzaye is unable to work due to ill health. Enkihunche we have known for several years, her son Emmanuel is in Day Care and sponsored by the project. Since Emmanuel has been in Day Care Enkihunche has always managed to find work, she worked in the local hospital as a cleaner but developed issues with the chemicals used for cleaning and was forced to leave. Since then she has been doing day work which is not ideal as she is HIV Positive and gets tired very quickly. Enkihunche asked if we could help repair her house and increase the size so she could rent more of the house and earn an income she is already renting some of it. She has saved 11,000 Birr about £371 to put towards the cost, this is an ‘amazing’ amount to have saved and we were happy to help her further. She realises that due to her health she needs to ensure a future for Emmanuel and working and renting parts of her house is bringing in an income and securing a future for them both. Sister Terfatu told us about a disabled lady who had asked for help with a roof repair. One evening we went to visit Muchaede. The circumstances were rather shocking. 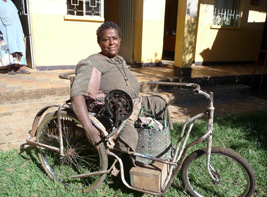 Muchaede disability is so severe that she has no use of her legs she has a hand cranked wheel chair that she manages to get about over the rough terrain. When at home she gets about by dragging herself by her arms. She has two children one in Day Care that the project supports. She survives by collecting firewood and selling it in the market. Her house was in a very poor state the roof was covered with plastic and wicker. We would have liked to pull the house down and rebuild it but were unable to get permission so a vast repair was undertaken by the local builder. We went to visit Muchaede after the repair and her smile was a delight knowing that her and her children would be dry during the rains.